The term “Gombroon ware” refers to a group of Iranian ceramics dating to the later 17th and early 18th centuries. They are instantly recognisable by their plain white body, which is sufficiently vitrified to become almost glass-like in its translucency. The body is made from crushed quartz, small amounts of white clay and ground-up glaze (frit), known as fritware. 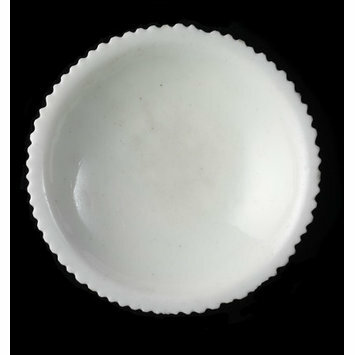 Gombroon ware is similar to contemporary Chinese export wares from the Dehua kilns, Fujian province, also in plain white. However, the shapes reflect objects used by the local market, especially small shallow dishes with incised decorations, wine cups, rose water sprinklers, bases for water pipes, multi-necked flower vases, dishes, and spittoons or sand pots. Historically, Gombroon was the name used by English traders to identify the strategic trading port Bandar-e Abbas on the Persian Gulf. The English traveller and writer John Fryer (d. 1733), in his <i>A New Account of East India and Persia being nine years' travels, 1672-1681</i>, 1698, mentions ‘Gombroon ware made of earth, the best next China.’ However, the term may have been used to describe Iranian fritwares in general, and not specifically white wares. Safavid fritwares were exported in small quantities into Europe between 1660 and 1690, when Chinese export porcelain ceased. The collection of Philippe d'Orléans, Regent of France (1674-1723), included '<i>porcelaine blanche de Perse</i>', and other examples were owned by Augustus the Strong (1670-1733) in Dresden. The English were also aware of Iranian fritware. In 1672, the English potter John Dwight (1633/6-1703), filed a patent for porcelain production: 'discovered the mistery of transparent earthenware comonly knowne by the name of porcelaine or China and Persian ware’. Martin Lister (1639-1712), an English physician and naturalist, while visiting the potteries at Saint-Cloud outside Paris in 1698, compared their soft-paste porcelain with glass-like Safavid fritwares: ‘Gomron ware; which is, indeed, little else but a total vitrification’. Horace Walpole (1717-97), of Strawberry Hill, owned, 'Two basons of most ancient Gombroon china, a present from Lord Vere, out of the collection of Lady Elizabeth Germaine', better known as Lady Betty Germaine (1680-1769), who inherited Drayton House, Northamptonshire, from her husband. 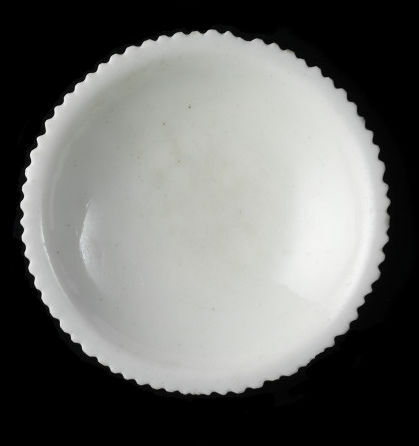 Dish for a condiment, fritware, of shallow saucer-shape, with flat everted rim with serrated edge, covered in a clear almost colourless glaze. 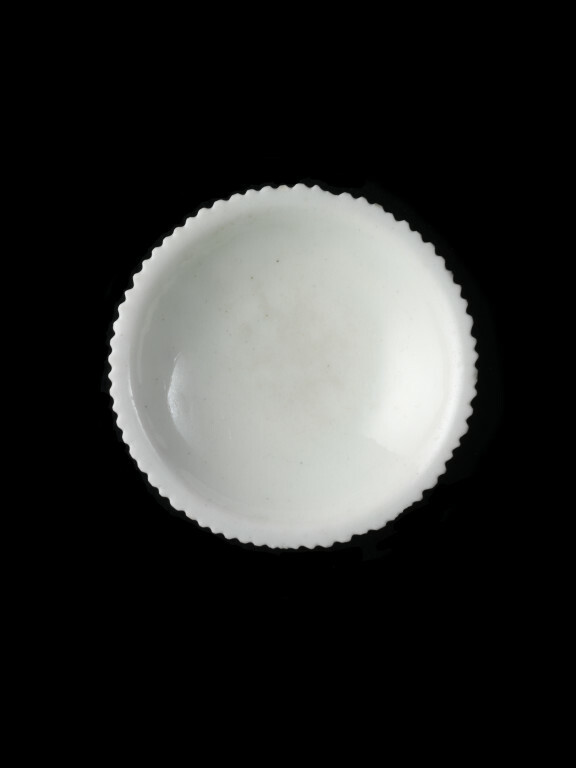 Dish, fritware, of shallow form with serrated edge, the white body with a clear glaze; Iran, 1650-1725.